The island of Maui is one of Hawaii's most popular destinations for vacations and holidays. Maui has over 33 miles of exquisite public beaches. Some of these beaches have jewel-toned sand, in such colors as red, gold, green, black and white. The most popular resort areas on Maui are Kapalua, Kaanapali, Lahaina, Wailea and Makena. These resort areas are on the western, or leeward shore and offer the traveler spectacular beaches. There is also the lovely, tropical village of Hana, with its world-famous "Road to Hana." On this special island surfing, scuba diving, snorkeling and spectacular sunsets create a serenely gorgeous way of life. 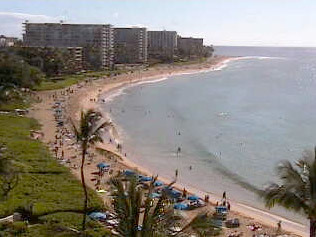 This streaming web cam is hosted from the Sheraton Maui Resort & Spa. Live streaming webcam from Maui Kai at Kaanapali Beach. This streaming webcam is from the Westin Maui Resort & Spa. Live streaming webcam from the Aston Mahana Condos at Kaanapali. Four streaming webcams from Kanaha Beach Park on the North Shore of Maui. Streaming Flash surf cam from Surfline with pre-roll advertisement. Napili Bay Maui webcam. Streaming, Flash based, pan, tilt, zoom, High quality. This small streaming webcam is coming live from the Outrigger Royal Kahana in Lahaina. 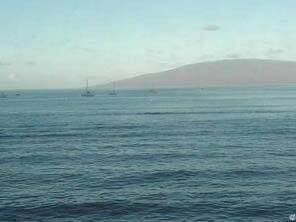 Live webcam from Front Street in Lahaina. Live webcam from the Kahului Airport in Maui. Still image updates every 30 seconds. This is a streaming beach cam with a view of Charley Young Beach at Kamaole 1 Beach in Kihei. Ho'okipa surfcam located on Maui's North Shore on the road to Hana. One of the best and most popular beaches on Maui is Kaanapali Beach. It stretches 4-miles long and is lined with hotels, resorts, open-air restaurants and the Whalers Village shopping center. A paved walk along the coast makes strolling from your hotel to these shops and restaurants a breeze. Kaanapali beach is also known for its Black Rock. This is a beautiful sandy beach with the famous Black Rock at the north end. It is one of the best snorkeling spots on the island. Maui offers travelers a range of accommodations to fit their budget, from modest condos to 5-star luxury resorts such as the Four Seasons and Ritz-Carlton, to even a luxury cruise. A travel professional or web surfing can help you arrange flights, lodging, cruises or even travel-packages. There are also many discounted vacations and holiday travel packages available on travel sites. Just 2-miles south of Kaanapali is the historic fishing village of Lahaina. With its hip eateries along Front Street, colorful boutiques, historic museums and contemporary art galleries, Lahaina is a great place to hang out in the evenings. Further south along the coast is the resort oasis of Wailea. Wailea is a favored area for the well-healed traveler. With its luxury hotels, 7 golf courses and upscale "Shops at Wailea," visitors can relax and shop and never need to leave the area. Inland from Wailea, one can travel to the base of the Haleakala Crater and then drive up 10,000 feet to the summit. You can drive up to the summit in your own car or there are several popular tours to choose from, such as a downhill bike ride. Many people prefer to do to the summit very early in the morning to watch the sun rise over Haleakala. You might also consider taking a day or two and make the spectacular drive to Hana. The "road to Hana" is a 50-mile drive full of magnificent landscapes, such as waterfalls, botanical gardens and lush rainforests. It's well worth the drive! Maui is also home to one of the best snorkeling spots in the USA. Just off the southern coast is the Molokini Crater. This is a half-submerged extinct volcano crater where hundreds of beautiful tropical fish and rare marine life like to gather, and it makes for a wonderful day adventure. Drive the "Road to Hana"